All Lua-tools for Celestia in one forum. Characteristic: Upgraded graphical interface to Celestia 1.6.1. Feature: Lua Universal Tools - intuitive interface. The minimum dimensions of monitor 700 x 900 pixels. Applications Languages: English (en), Russian (ru), French (fr) when changing font sans10.txf. Use and distribution of this software is authorized according to the license Creative Commons (CC BY-NC-ND) v4.0. 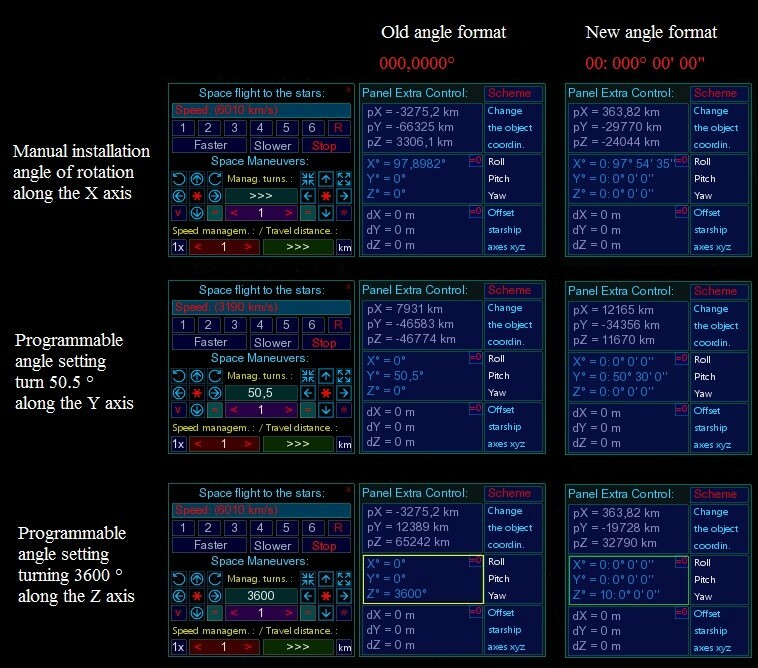 Parameters Graphical interface LUA EDU TOOLS and LUA Universal TOOLS. LET replaces 50 controls, that's ~ 40%. LUT-5 replaces 112 controls ~ 90% !!! in LET there are 35 tools and features. it's ~ 3 times more !!! 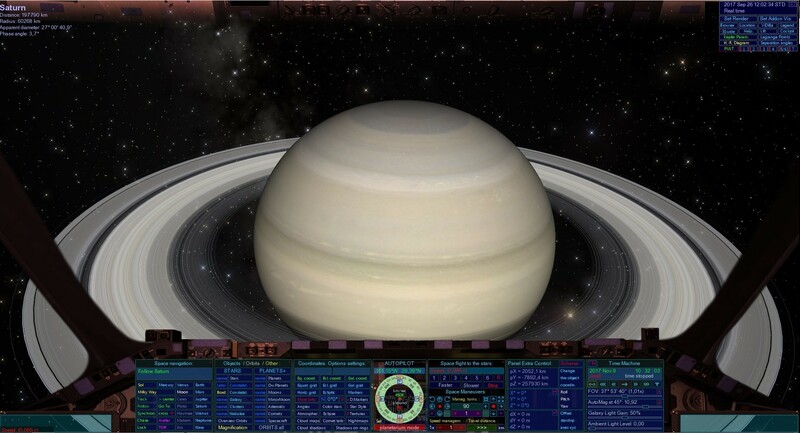 In this form, Celestia will be more accessible to astronomy enthusiasts from 7 years old to 70 years old and up ! to the font sans10.txf (from 16.08.2009 70Kb). To do this, you need to edit the extensions of these files. Note. The GUI has its own configuration file. By default, language = "en"
It can be changed in the section "Define the language of the Lua Universal Tools' Graphical Interface." Note. 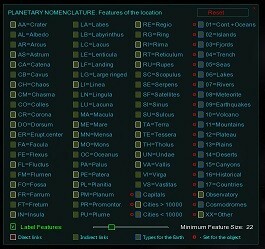 When installing the GUI, solarsys.ssc will be loaded without Pluto-Charon. Note. Correction of errors see message # 4. Note. When installing the GUI, all the regular * locs files will not be loaded. Note. The Space exploration and Other sections will not work without spacecraft bases that are not included in the LUT-5 package. Start Celestia in the window ~ 700 x 900. Open your window to full screen. Check in the bottom left corner of the screen the message "speed (3190 km / s)." It shall be red. If the color is white, the LUT-5 is not installed correctly! Click button PULT (en)/Pupitre(fr). Check the graphic interface LUT-5 with screenshot. If in the top right corner are revealed distortions in geometry, LUT-5 is established wrong! Try the again restart Celestia. 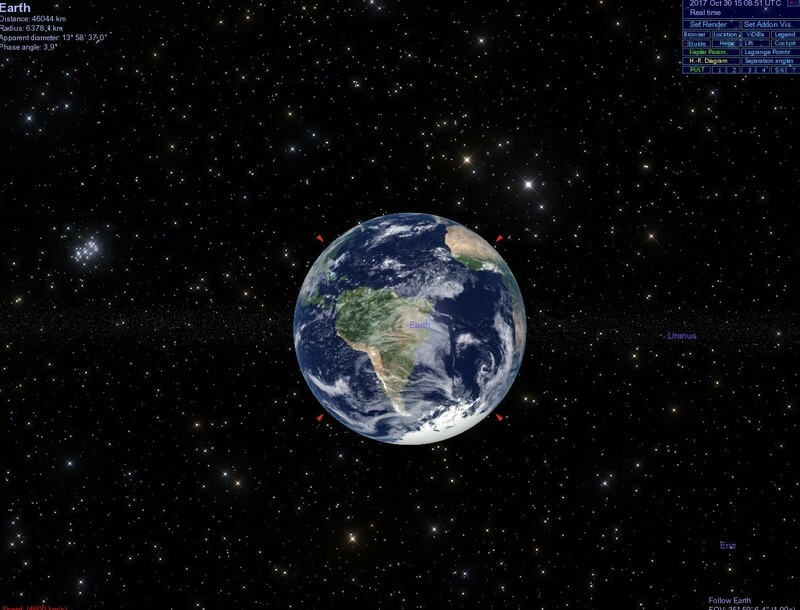 Check Celestia for the presence of brakes on the Earth's rotation example. On panel "Time Machine" increase the speed of rotation ~ 1000x. If the Earth rotates smoothly without jerks, launch Celestia was normal. If the Earth rotates jerky, try restarting Celestia. Last edited by Alexell on 14.12.2017, 12:42, edited 2 times in total. I think I echo Croc asking you to give us your first impressions. Tell us if you have any problems, or ask us the questions that bother you. The accompanying text of the release (see message # 1) is amended as of 11.12.2017. This is due to the partitioning of the archive into logical modules. As a result, when the LUT-5_basic_module is loaded, the graphical interface becomes functional. 1. New edition locale_cockpits_en.lua and locale_cockpits_fr.lua. Copy the files to the folder lua-applications/cockpits/locale. Give permission to replace files. Copy the file to the folder lua-applications/lua_universal_tools_v5/locale/ru. These buttons increase or decrease the s/round value by 20%. The button [>] increases the value by 10 units, if the initial value >25. The button [<] decreases the value by 10 units if the original value >35. The button [>] increases the value by 5 units, if the initial value >=0. The button [<] decreases the value by 5 units if the original value >=10. Update the tool "Time Machine" (see Panel 7 of the control panel). Novation - the mode of the clock with an accuracy of 1/100 second. Purpose - a step-by-step preview of the movement of the object with an interval of 1/100 second. The author of the idea is Croc. Fall Impact on Comet Tempel 1. Centiseconds is the 6th and 7th decimal digit in JDate. In the first screenshot it's ..... 06, in the second ..... 07. Difference = 1 centisecond. In the Pause mode, the mouse displays the [centisecond] window. Next, the mouse is pressed with the mouse [<] or [>]. Update the tool "Time Machine"
The layout of the GUI menu is changed, located in the upper right corner of the screen to place the new tool. The menu width is increased to 200 pixels. Less will be abbreviated names. A new tool will take its place !!! New tool - ObjectVisibilityButton.lua for asteroids and comets managed by Vi. Di. Ba. Note. In menuLine1-7Box.zip includes the updated files for the new menu layout for the LUT-5. See the previous message. Hello, is there any way to disable the options that we do not want to be activated by default? For example, I do not like to start the program with the checked marks or the names of the locations. When I start the program they are activated, I deactivate them, but when I start again they are activated again by default. Please note that the selected check-boxes are included. However, there is still a tick in the check-box [Markers]. I do not know where this team comes from. If it is not needed, you can disable it manually. Note. Graphic the interface does not take part in saving the selected parameters and in restoring from at startup. If you want to set the selected set of options, save them using Menu / Bookmarks. For details, see the Celestia User Guide. The screenshot shows that the date and time line is shifted to the left outside the LUT menu. This function is controlled by Celestia and does not refer to the LUT. transfer the control function of the date and time line from Celestia to LUT. Adding the "Pause" button - [ II ]. Without this, it is premature to install a new modification! In the attachment Guides with updated coordinates. 2. Delete the folder ... \ lua-applications \ lua_universal_tools_v5 \ guides "
Just out of curiosity, how did you get the stars to look so good in the first pic on your first post in this thread? Screenshot in the message # 1 is made on the experimental version 1.7.0. I have not worked with the prototype version 1.7.0 for more than a year. identical to the display and 7 buttons in the Panel 7 (Time Machine). Is there a way (or shortcut) to show and hide the panels?